These activities and programs are free of charge thanks to the support of our members. Please consider joining us today! 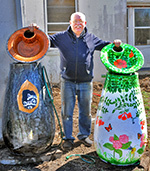 Two rain barrels handpainted by Jim Gallagher. Help slow stormwater runoff and add a touch of art to your garden! The next Bluebell Festival is Sunday, April 8 2018! The Occoquan Greenway Trail - Ten Year Anniversary Hike! Ten years ago we led the first hike down the Occoquan Greenway Trail from the McCoart Center to the Town of Occoquan, beginning a community effort open the trail to the public. Today, about 2.4 miles of trail is available for hiking, from Lake Ridge Park to Cotton Mill Drive. On October 28, we will hike about 7 miles, from Lake Ridge Park to the Town of Occoquan. 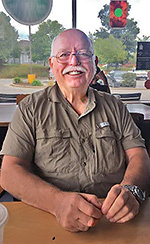 Jim Gallagher is a local artist who creates a new perspective by connecting art and nature. He is President of PW Art Society and has been part of PWCA since 2010. Jim thinks art is a great tool to inspire people to get out and see nature. Art can encourage encourage people to pause and think about something they may have otherwise not considered. Every year Jim paints a rain barrel to raffle off at the Bluebell Festival, an important fundraiser that adds an artful touch to backyards. Jim also painted the mural on the kiosk by the Stone House at Merrimac Farm, helping create a sense of place. Jim says that being part of PWCA has changed his perspective on protecting nature. Prior to joining, he thinks that he would have simply cut down an inconveniently located tree. Now, Jim says he understands the tree is home to a wide array of wildlife and would make a different choice today. His advice to anyone thinking about volunteering? Do it! Change starts from doing things, not just thinking about doing them. Thank you, Jim, for all that you do! Thanks to volunteer support, we created an area at Merrimac Farm WMA where people and the environment can come together as one. Join us as we search for butterflies! 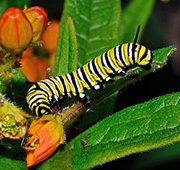 Learn how to identify butterflies and the value of habitat diversity, meet new friends, and explore the great outdoors. Sun, Sept 10, at 2pm. 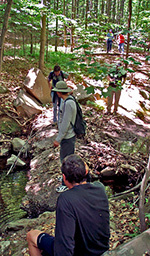 A variety of approaches to protect these important resources are available, ranging from hard fixes to investments that enhance natural areas.